This workshop delivers a solid working knowledge of Lean-powered improvement – while developing the skills, abilities, and confidence of workshop participants. 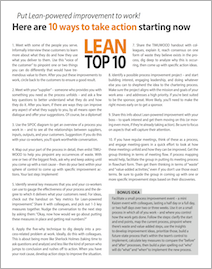 They get an immediate opportunity to put Lean methods and tools to work. And they plan how they’ll put their know-how to work going forward – on their own and in their work groups. This is a hands-on session that gets positive change under way. Lean Six Sigma is a body of knowledge and practice focused on understanding work in terms of processes. Lean-minded people strive to eliminate inefficiencies, ensure effectiveness, and deliver the very best to their customers. This workshop brings the concepts down to earth, supplying a set of simple yet powerful techniques for achieving real improvement right away. Who it’s for: Depending on your needs and circumstances, the training can involve a large or small group (maximum 20, minimum 5). Sessions can be all-inclusive, with staff and managers having a shared learning experience. Or, they can be tailored for specific groups. For example, it works great when everyone (or at least several people) from a work area or team attend, because they can discuss their new know-how and plan how to use it together. This increases the chance that the ideas and tools will gain traction when the workshop winds down and people ramp back up with their regular work. Add-on sessions: A 1-day Power Session or Deep Dive Session can be added. It’s typically scheduled for the day after the workshop. A Power Session is a 1-day add-on in which the group (or a subgroup) uses one or more of the methods/tools in detail to develop an actual improvement. This day is facilitated by the workshop leader. 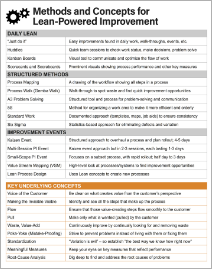 It’s a great opportunity to leverage Lean approaches while the learnings are fresh in everyone’s minds. 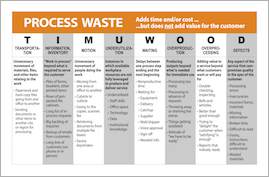 Example: A subgroup of workshop attendees spends the day mapping their current-state work process and pinpointing waste. They identify a set of “just do it” improvements – and identify several more-involved next steps. Then they build a plan that identifies all actions to get this done over the next several weeks, with start/finish dates for each action, and clear designation of who’s leading and who else is involved. 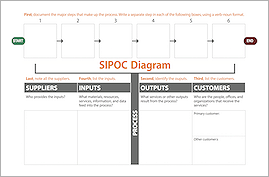 Example: A subgroup creates a high-level process map, discusses process-related measures, gets added guidance from the workshop leader, reaches consensus on a set of several high-priority measures to follow going forward – then develops a scorecard so they can easily see and track these measures on a week-to-week basis. 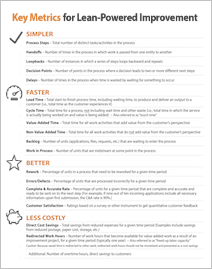 A Deep Dive Session, lasting one day, goes into depth on one, two, or three of the Lean-powered improvements tools – with added time to allow for hands-on activities. The focus of this session can be determined before the workshop is scheduled, or it can be decided by the workshop participants at the conclusion of their workshop – with the Deep Dive session held the next day. Click below for a comprehensive list of topics that are covered in the workshop. Foundational topics are covered in all of the time formats, and the concepts are brought to life with hands-on activities and real-world application. Longer sessions allow for more content, with the 3-day session covering all topics shown below. For a given workshop, the final agenda is based on the group’s current level of know-how, the workplace culture, the near-term objectives and longer-range aspirations, and an understanding of which Lean approaches are likely to bring the greatest benefit to the workplace over the next six or so months. During a given workshop, more time is devoted to select methods and tools. This tailored focus in based on the group’s learning goals and others factors. Right-sizing the scope, developing the charter, building the team, etc. Making sure this new know-how is used: Toward the end of the session, participants are guided in thinking about, talking through, and planning out how they’re going to put the most promising Lean-powered approaches to work. Individuals determine their own action steps. If teams or work groups are present, they decide on their collective actions. The final step engages the entire workshop group as they’re prompted to identify several doable next steps that can benefit the workplace as a whole.